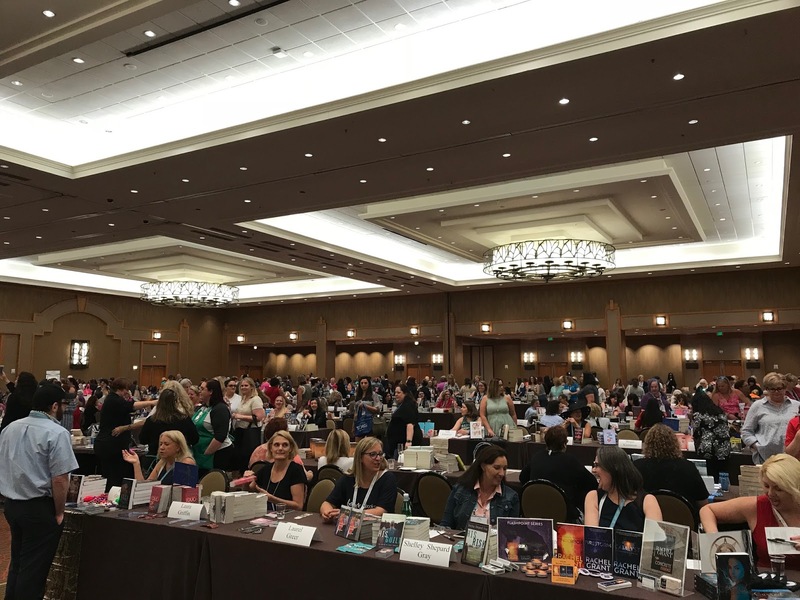 Seekerville: The Journey Continues: Ten Highlights from RWA 2018! Ten Highlights from RWA 2018! 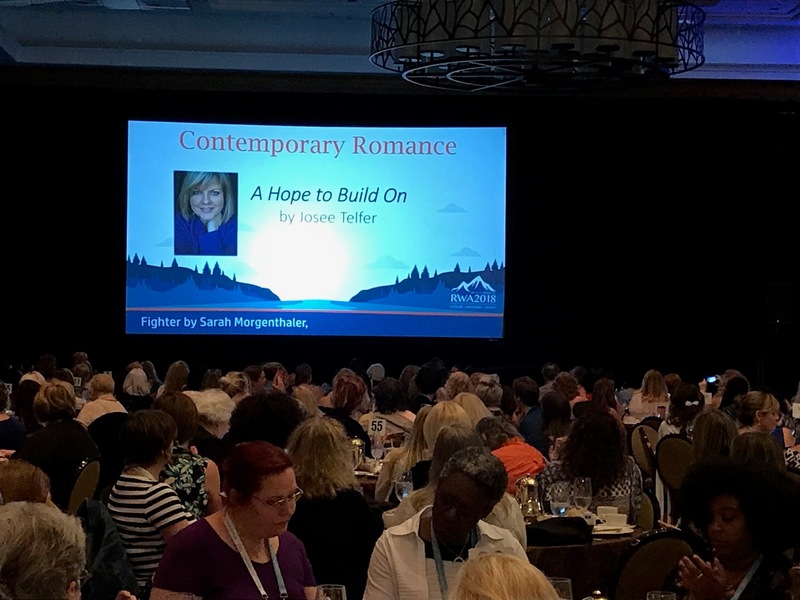 Last week, writers from around the world gathered in Denver, Colorado, for the Romance Writers of America National Conference. Josee Telfer and I shared a room. 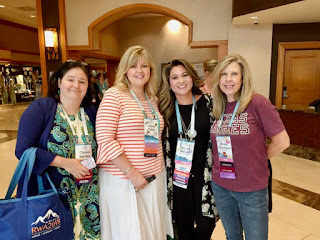 We knew each other from Seekerville, and the friendship that had developed online grew deeper when we met in person and spent time together throughout the week. 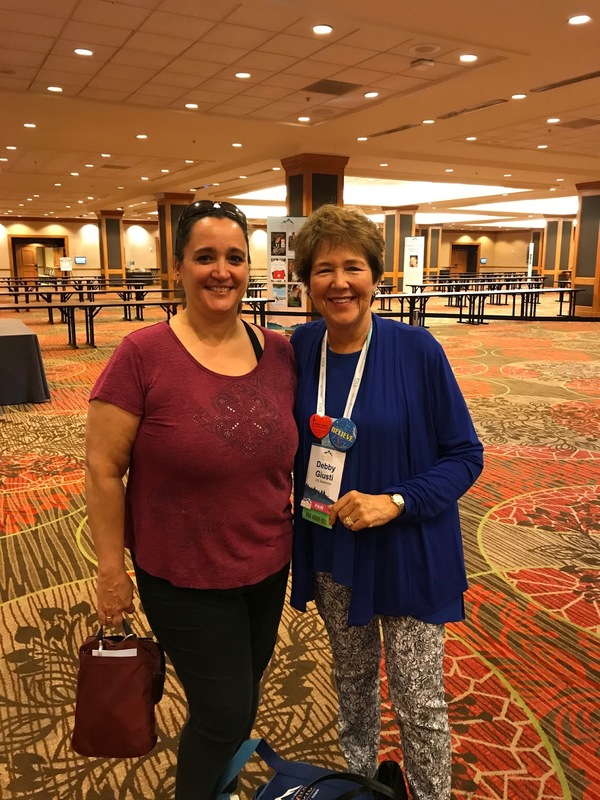 Josee is a 2018 Golden Heart finalist and first-time RWA National Conference attendee. 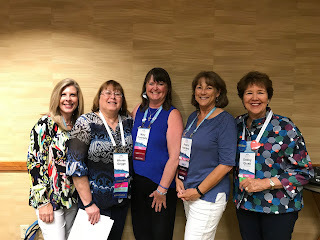 I’m a 25-year RWA veteran and author of as many books so we decided to team up and provide an overview of what we each enjoyed most about the conference. 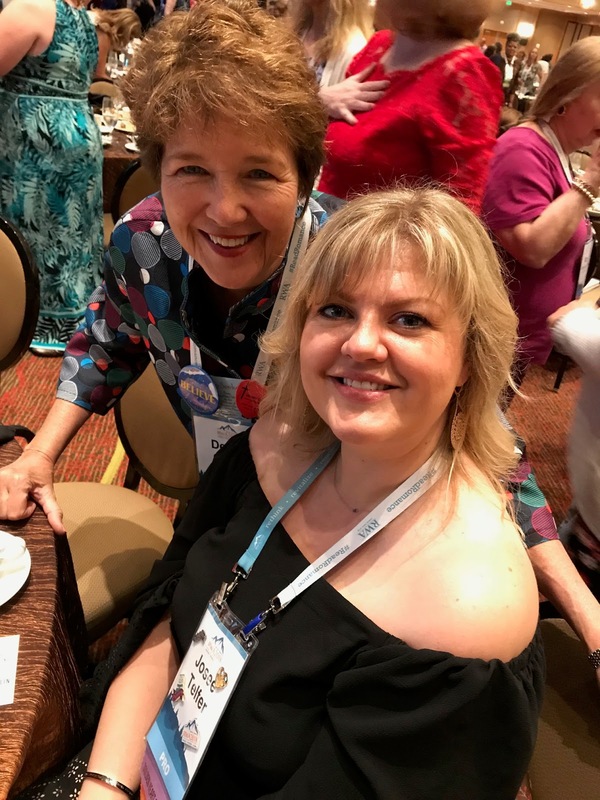 Audra Harders and Debby Giusti at RWA 2018. 1. Connecting with other writers tops my list. About two thousand writers and industry professionals attend the national conference each year, and although that sounds like a lot of people, friendships form easily because we share a common bond with our love of writing. I’ve attended just about every national conference since 2005 so the week of conference always seems like a “coming home” of sorts. I see folks I’ve known for years. We quickly catch up on our writing careers, kids and grandkids and anything else that’s important in our lives. Throughout the year, we keep in touch via email and social media, but the time together at conference is always special, like icing on a friendship cake. at the LI Meet and Greet. I write for Love Inspired, the Christian arm of Harlequin. 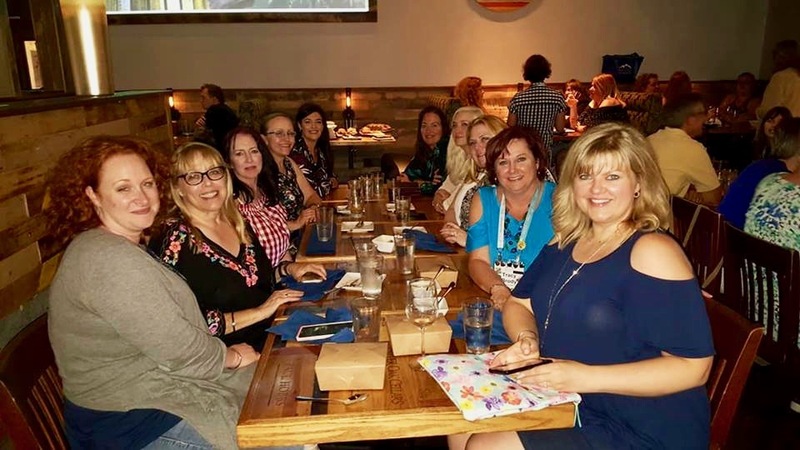 Each year at the conference, Harlequin hosts a number of informational meetings and gatherings to help their authors with marketing and promotion. 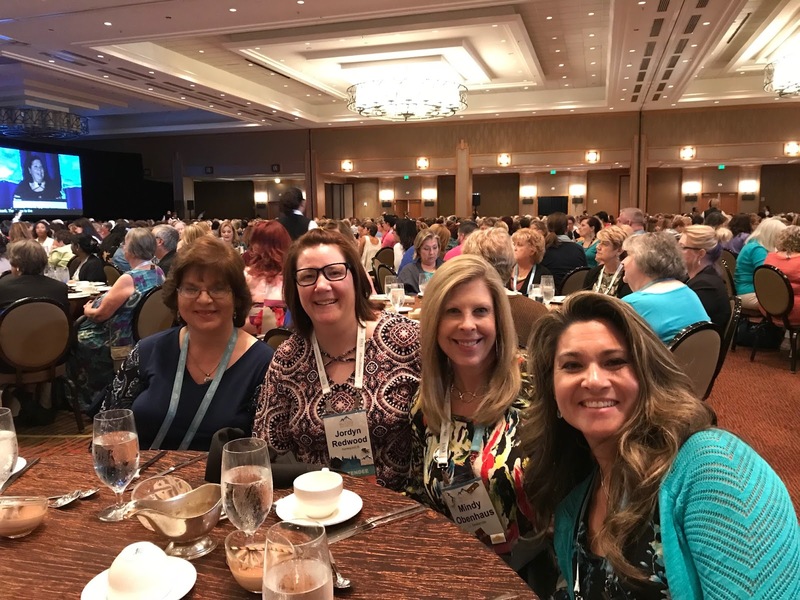 In addition, we learn about new retail initiatives and the many innovative ways Harlequin ensures our books get into the hands of our wonderful readers. 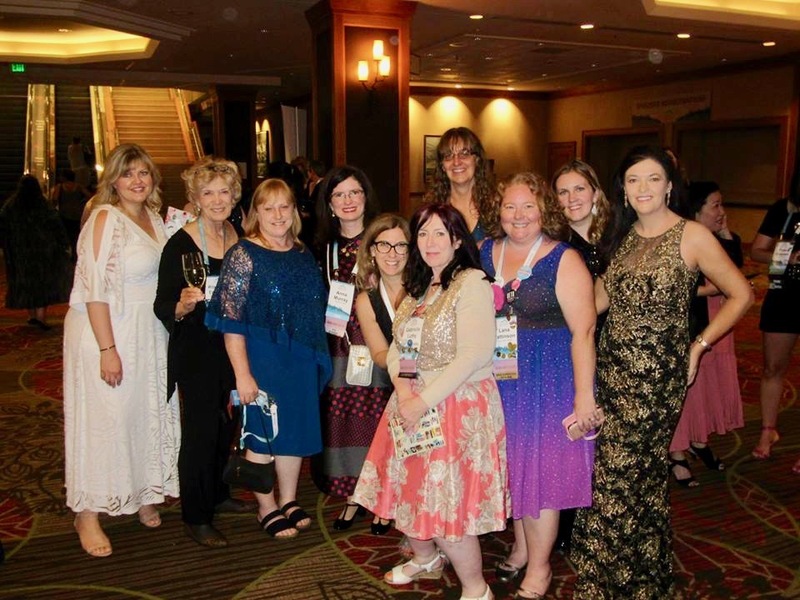 Along with marketing tips, IT support and Q & As, Harlequin also hosts a gala party for their authors. This year, we gathered at the Ritz-Carlton and danced the night away! Debby Giusti at the Ritz-Carlton, Denver. The conference runs from Wednesday through Saturday, and every day is filled with workshops that range from career and research to craft and the writer’s life. There’s something for everyone and for every level of expertise from the beginning writer to the multi-published, bestselling author. I attended Alexandra Sokoloff’s two-hour Immersion session, “Stealing Hollywood.” An acclaimed screenwriter and novelist, Sokoloff gives story structure workshops throughout the country based on her book, Screenwriting Tricks for Authors. At RWA, she talked about writing stories that engage the reader and started by providing an overview of Greek theater and the Three Act Structure that dates back to 400-600 BC. As theater evolved, the second act in most plays grew longer and was often divided into two parts, Act II:1 and Act II:2. With the introduction of movies, each of the three (or four) acts were divided into segments, called sequences that ended with a hook. In the early days, movies were filmed on eight reels that each contained fifteen minutes of action. The reels—or sequences--ended with a cliffhanger to keep theater audiences in their seats and eager for the next segment of the story as the reels were being changed. Over the years, that eight sequence format has been ingrained in theater goers as well as readers who expect eight hooks or turning points that grow toward the exciting final climax and resolution. Sokoloff encouraged us to use the eight sequence structure to satisfy reader expectations and to make our stories more compelling and marketable. In addition to a plethora of workshops, the RWA provides something extra for both their PAN (published authors) and PRO (writers nearing publication) members. Rosanne Bane discusses how the brain functions. Rosanne Bane was this year’s PAN Keynote speaker. She calls herself a Creativity Coach who, as she says, “specializes in helping creative people understand why it’s so hard (at times) to do the very thing they love to do and what to do about that resistance.” Her workshop, “Romancing the Creative Brain: Avoiding Burnout and Block,” drew a huge crowd of published authors eager to learn constructive ways to navigate the writing life. According to Bane, stress is the new normal, which isn’t good for our mental or physical health. She showed us how the brain works with emphasis on the limbic system that deals with involuntary reactions, such as flight or fight responses, contrasted with the cortex that makes good, conscious decisions and is our creative, storytelling area. Stress stimulates the limbic and suppresses the cortex. Chronic stress takes its toll with anxiety, sleep disorders and self-doubt. Self-care is necessary to inhibit the limbic and enhance cortex activity. To optimize brain function and enhance creativity, we need sleep, exercise, meditation and downtime to daydream. We also need to incorporate play into our busy schedules for a healthier and happier life! Debby Giusti at RWA's Literacy Autographing. 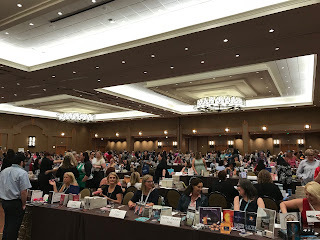 At the conference, RWA hosts the “Readers for Life” Literacy Autographing where 400-plus authors and thousands of readers connect. The publishers provide the books and proceeds from the sale of the books go to literacy organizations in the local areas. The 2017 signing raised more than $45,000, and since 1990, RWA has raised over $1 million for literacy organizations around the country. Meeting readers is what I love most about writing. One lady at the signing said she had driven from Colorado Springs to see me. Another woman maintains her direct mailing subscription with Love Inspired Suspense so she can get my books before they appear on bookstore shelves. A number of other readers shared the enjoyment they get from my books. As you can imagine, their comments touched me deeply. When I’m at home, sitting at my computer, struggling with a new story and wondering if I should continue writing, I'll remember their kind words and will be buoyed by their support. The Golden Heart Persisters pose for a photo! In my Golden Heart Group, The Persisters, I spent time with other finalists and formed friendships I’ll carry throughout my life. Encounters with industry professionals whether in the lobby, the elevators, and the hallways lead to important connections as we build our platforms and grow our businesses. For many authors, it may be the only time they meet with their agent and editors face to face. You never know who you may meet and what that will lead to. In my case, I shared an Uber with two talented authors and all-around lovely ladies whose books I adore. I also thanked an agent who rejected my query because I wanted her to know how deeply I appreciated her gracious, personalized and thoughtful response and that it was a turning point in my career. Many of us spend a lot of our time in yoga pants at our desks but conference gives us an opportunity to get gussied up. 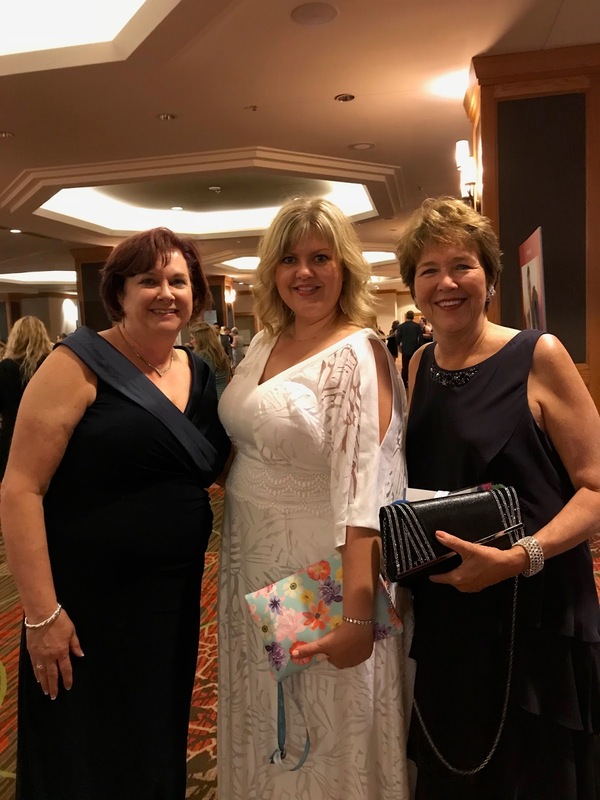 Whether it’s the Golden Heart luncheon, dancing at the Rita’s, our publisher parties or dinner out with our tribe, it’s good to eat, laugh and cut the rug with our new and old friends. Whether you’re a newbie or have just published your fiftieth novel, RWA offers something for everyone. There are classes for every sub-genre, as well as workshops for hybrid and indie published authors. Sessions run the gamut, from marketing your book, social media presence and branding, to in-depth classes on the writing craft and time management. Education happens outside of workshops as well. I learned a lot from conversations where someone shared a word of advice, or an experience that provided a fresh perspective. Josee Telfer and the Golden Heart Persisters enjoy dinner together! It’s easy to get comfortable in our writing caves where we rarely have to venture outside and beyond our imaginations. There’s nothing simple about traveling but it’s good to push ourselves outside our comfort zones. It keeps us sharp and agile and you never know when inspiration will strike. You’ve got to live life to write it. Mindy Obenhaus in the hotel lobby. 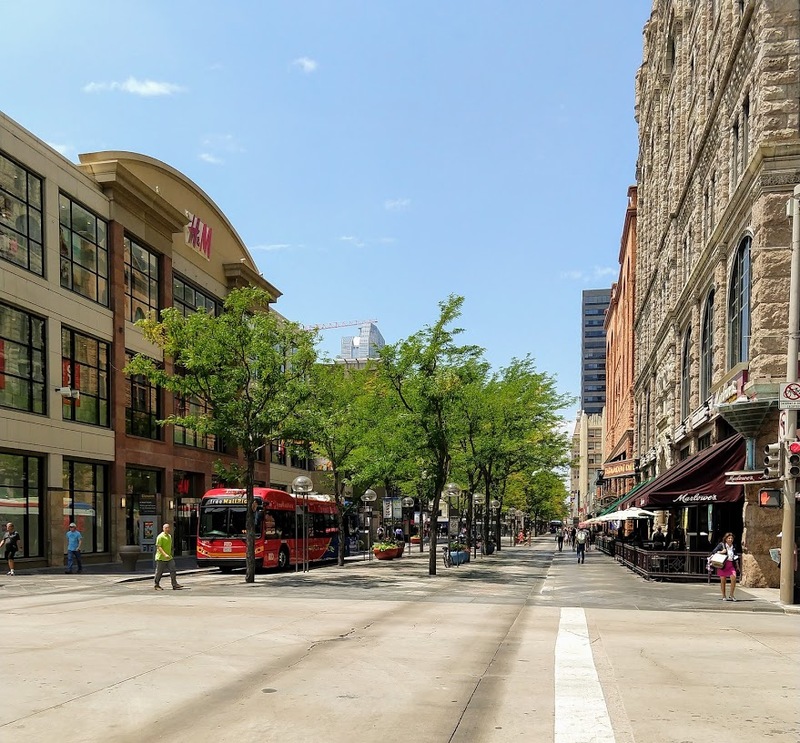 I got two novel ideas while in Denver which came from conversations with editors and other writers. These conversations often provide inspiration. Maybe you’re unsure of which direction to take in your career, perhaps you’re stuck in a current novel and don’t know your way out, or maybe you’re coming up empty with fresh ideas for new stories. The conference was a reminder for me to get out more and meet with fellow authors whenever possible to brainstorm, learn, grow and laugh. gather after the RITA Award Ceremony. 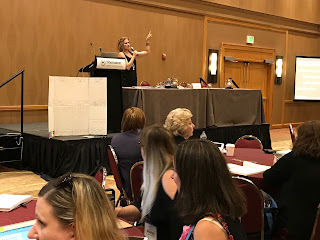 I hope you enjoy the photos we posted today and the glimpse we provided into this year’s RWA conference. Josee and I are eager to read and answer your comments and questions. Let us know what you like best about writing conferences or what you hope to learn from a conference you someday plan to attend. stopped by the conference to say hello! 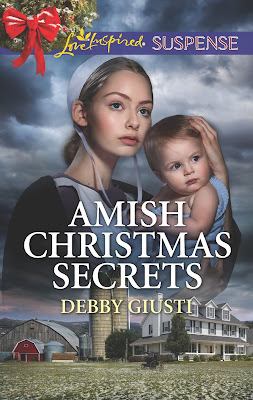 Each name will be included in a drawing for the first giveaway of the fourth and final book in my Amish Protectors Series: Amish Christmas Secrets. Josee is giving away Pure Vermont Hard Maple Candies to the winner so be sure to leave a comment. 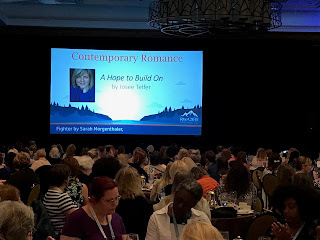 RWA 2019 in New York City! to save the woman he secretly loves? 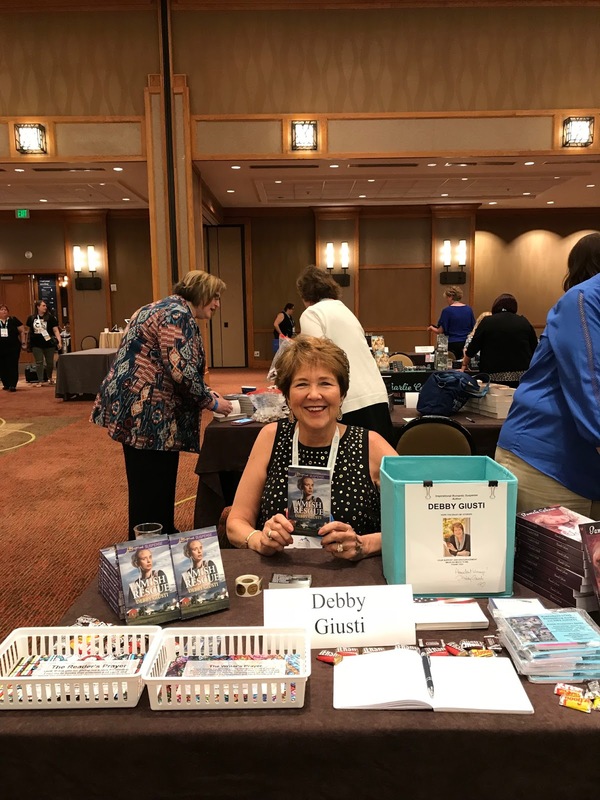 Publishers Weekly bestselling author DebbyGiusti is also a medical technologist who loves working with test tubes and petri dishes almost as much as she loves to write. Growing up as an Army Brat, Debby met and married her husband--then a Captain in the Army--at Fort Knox, Kentucky. Together they traveled the world, raised three wonderful Army Brats of their own and eventually settled in Peachtree City, Georgia, where Debby spins tales of suspense that touch the heart and soul. 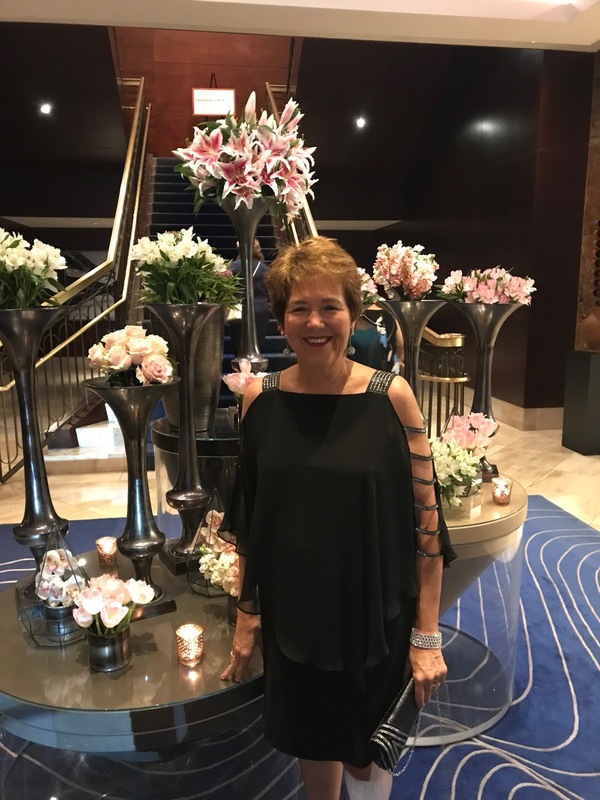 Debby’s stories have won numerous awards, including two Daphne du Maurier Awards for Inspirational Suspense, the National Readers’ Choice Award, the Golden Quill, the Beacon, the Gayle Wilson Award of Excellence and the Write Touch. In addition to full-length fiction, Debby has written magazine articles for Southern Lady, Woman’s World, Our Sunday Visitor, Army and Family, and served for over twelve years on the editorial advisory board of ADVANCE for Administrators of the Laboratory. So glad you found Seekerville, Fernanda! We always post something about writing or the books we love to read. Be sure to visit us again! Oh my stars, this is fun to live vicariously through your escapades! I expect this was an enormous amount of fun... and so many good resources to tap into. Well done, ladies! And I might join you in NYC next year at least long enough to enjoy the Harlequin party... It would be so much fun to dance and share desserts with you guys! Josee, I am a huge proponent of us learning and gaining all the knowledge we can. Meeting industry professionals, meeting other authors, attending spotlights, etc.... what a great opportunity and I'm so proud of your success. Go get 'em, Tiger!!! Debby, thank you for all of this, and you look as marvelous as ever, brat! I'm so glad you all had a great time and good to see so many Seekers there! We missed you, Ruthy! I only saw Mary Connealy for a short time. We grabbed a quick burger one evening and visited with DebH, who was so sweet to come to the hotel to say hello! Her little guy was with her and he stole my heart! What a delightful young man. Of course, Deb is wonderful. But I didn't get enough time to visit with either lady...and Audra and I connected in the hallways on our way to workshops and never had the opportunity for a long chat. The conference is always so busy. This time the evening events started at 7 PM and the last workshops ended at 5...so it was a rush to grab food and get ready for the next function. How fun that you got to meet Deb and Guppy! Thank you, Ruthy! It's amazing how much I learned just from casual conversations. It also helps that I had the best roomie! Good morning, Seekerville! The coffee's hot. I'm sipping my second cup. I've brought an assortment of muffins and pastries, along with a bowl of fresh fruit, for breakfast. Scones and bagels too! Enjoy! I'm on my first. But I've got fresh peach muffins cooling! Reaching for a peach muffin! Perfect for an overcast day in GA! Thanks for letting my live vicariously. I hope to get to another RWA conference soon. Missy, you were missed! I always love the workshops too. RWA offers so many outstanding programs from the leaders in the industry! Wish I could absorb it all! It was such a great experience meeting so many online friends face-to-face. Going to my first conference already knowing so many people helped make it less overwhelming too. I can totally see that, Missy! I forgot who it was but someone told me, "Whatever you do, don't try to do it all. Take time to decompress, rest and relax or you'll be burned out by day 3." Great post, Debby and Josee! So exciting to see pics of people I've come to know online. Looks like y'all had a wonderful time - thanks for sharing your experience and photos! Laura, I loved seeing your picture and title on the big screen for the Golden Heart...two times!!! Congrats on your GH success! Hopefully, you'll be able to connect with your Persister sisters in the years ahead. Hugs! Thank you, Debby! I watched the awards ceremony from home - it was so exciting! You were missed, Laura. But I was beaming with pride that a fellow mentoring sister was a TWICE named GH finalist! Looking forward to meeting you one day too! You don't have to sell me on the importance of conferences, but it's good to see all the reasons in one place, and by authors at different stages of their careers. Josee, I love the idea of personally thanking the agent who rejected you. I'm planning to do that at ACFW, it was a good learning experience and she was gracious about everything. Looking forward to ACFW, the pieces are coming together. Asking God to help me prepare my heart for, well, anything. Josee, would love to read your book when it comes out. I'm in New Hampshire. Not that many of us in New England, or at least not that I know about. Wrote for an hour this morning. Got to do my secular work, back in a bit. I'm so looking forward to meeting you in person at ACFW, Kathy. Yes, Kathy - there aren't a ton of us, especially in northern NE, that's for sure! You should have seen the agent's face when I approached her. Her eyes went huge and she looked stunned. I wonder if I was the first person who'd ever done that? But she seemed genuinely touched. It was just something I felt led to do and I'm glad I did. I won't be at ACFW and hate that I won't see everyone at that conference. Know that I'll be eager for FB pictures and perhaps blog posts that will give me a glimpse into the Nashville conference. I know you'll enjoy every minute, KB. So excited about where you are on your writing journey. In Seekerville, we celebrate every step forward...seems you've been covering so many miles and all so quickly. Thank you Josee and Debby for sharing your RWA highlights (and all the great pics)! Looks like so much fun and high energy. I can't imagine 400 authors packed into one room to sign books for literacy. WOW! Glynna - it was an experience! The lobby would fill up with so many people (and it was so loud) I escaped daily, walking around the hotel to grab breakfast or lunch or just a coffee. But yes, so much energy! I enjoy meeting first-timers at the signing as well as readers. The energy in the room is amazing...and everyone there loves books! Plus, I'm so proud of RWA for raising $1 Million dollars for literacy. That means a lot of folks across the country have learned to read because of our outreach. In my opinion, that's a win-win! 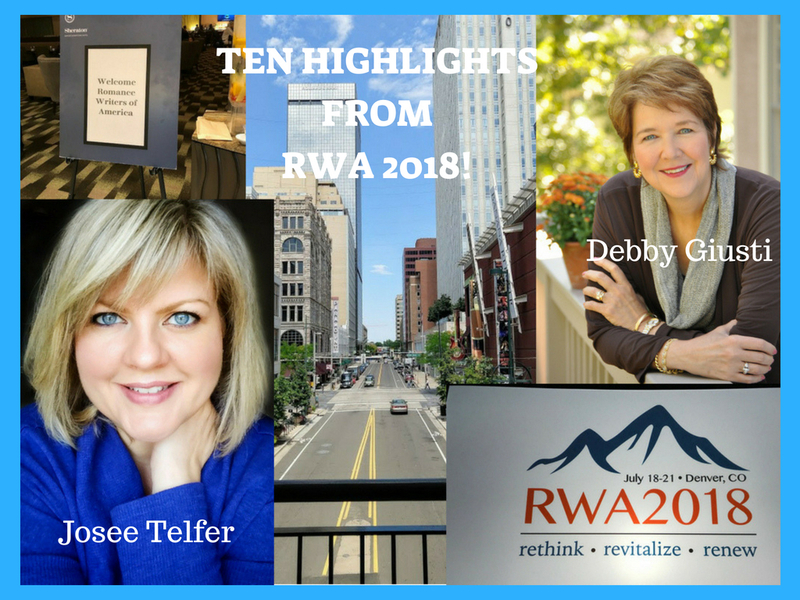 Debby and Josee, thanks so much for the RWA conference recap! Loved living vicariously through you both for a few moments. What gracious, lovely ladies you are! I hope to see you both at ACFW this year! I won't be attending ACFW this year but I hope to someday! What I didn't write in my blog post was that the FIRST night, I slipped and fell (blaming it on the altitude) and tweaked my back. The following day I couldn't move. I ended up missing a lot of the festivities, especially for the GH finalists. But Debby was so helpful and kind as were many of my fellow GH "Persisters." They came through with meals brought to my room, medicine, muscle cream and prayers. It was a blessing during what was a tough couple of days! I was so worried about Josee. She couldn't walk for two days! Oh, Josee, no!! That's so awful!!! I'm so, so sorry. I hope your back is feeling better now. How awful, Josee. There's nothing worse than being sick at a conference. Thank you for this fun post, Debby and Josee. I love living vicariously through everyone at these conferences. Looking forward to your first novel, Josee. Debby, congrats on all your many novels. Love the cover of your Christmas one. Please put me in the drawing. Thank you, Sandy! I'm still "unpacking" all the memories from Denver. And, I still have conference brain! 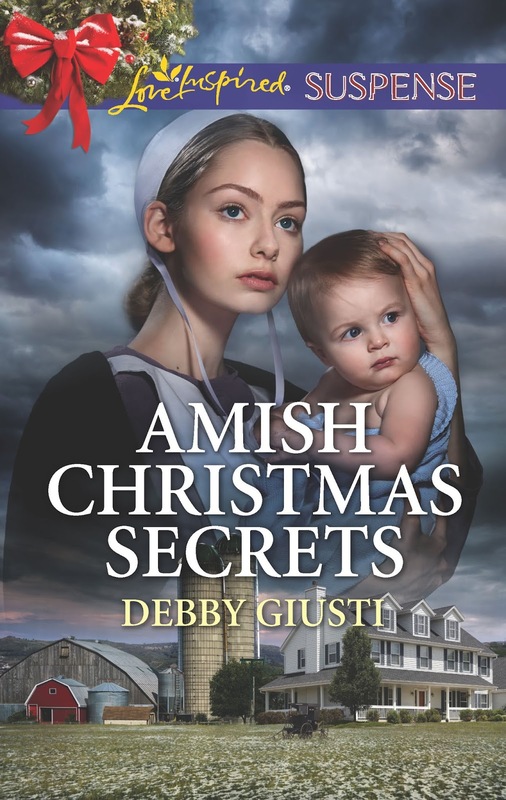 Sandy, so glad you like the cover on AMISH CHRISTMAS SECRETS. I was thrilled when I saw it. Yes, you're in the drawing! 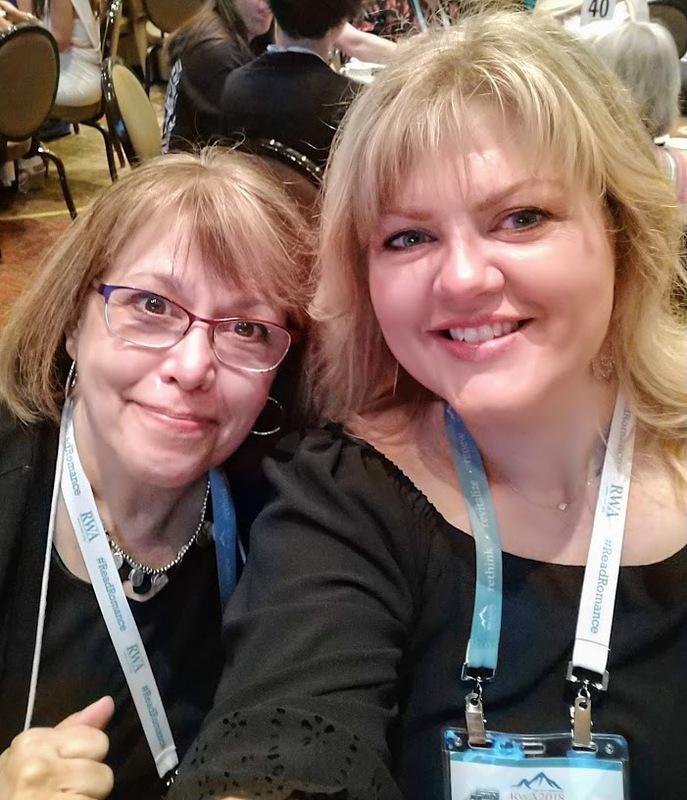 This was a great recap of the conference, Debby and Josee! What an exciting week for both of you! My favorite part of writing conferences is spending time with other people who understand what our lives are like. They understand deadlines, procrastination, working through story blocks, and carving out writing time in the midst of life. Even my husband can't claim to understand those things! Now I'm looking forward to reports from ACFW! Same here, Jan. Finding my tribe helped me feel so much more normal. Jan, Rosanne Bane's workshop was excellent. I've referred back to what she said a number of times over the last few days and am taking to heart the need for play. I don't play enough, that's for sure. BTW, when she mentioned meditation as being healthy, think PRAYER! Especially contemplative prayer that draws us move closely to the Lord and helps us to leave the worries and frustrations of this life behind. I'm trying to let go of stress and embrace health and wholeness! Josee and Debby, what a great recap! Meeting you and my other online writing pals IRL (love this by the way, Josee) was by far the biggest highlight of the conference for me. And screaming "Josee!!!" at the Golden Heart Awards. :) It's definitely an experience I'll never forget. Ah, Sharee, you're so sweet - I felt the love, I did! Meeting you and Tina, Debby, and so many other fantastic authors was definitely THE highlight of my conference week! I loved seeing the "debut author" on your name tag - so exciting! You've got a big, bright, beautiful writing career ahead of you! Sharee, I was so glad we could spend time together at this conference. 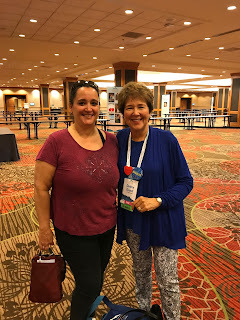 I enjoyed meeting you at ACFW when it was last held in Nashville and have been rejoicing for your publishing success...but being with you in Denver was, as I mentioned, icing on the friendship cake! Hugs and love for sure! Along with lots of icing! Josee, it was such a pleasure to meet you and spend some time with you in Denver. You are such a joy to be around. Someone who can light up a room with her smile. And Debby, I can't tell you how bless I feel that I got to spend some extended time with you. Your sweet spirit always refreshes me. I could learn a lot from you, my friend. Mindy...ah you're making me teary. Thank you. I enjoyed getting to know you- you made me laugh! I so appreciate the connections I made at conference. And yes, isn't Debby a refreshing stream? That's how I feel around her. Calm, peaceful and funny, too! I've enjoyed seeing all the pictures from this year's conference as well as reading about the conference. Attending a conference is on my wish list. Thanks for sharing. Wilani, I've been praying for you. I heard the news about your father and have been lifting you up during this time of grief. I hope you find comfort in the days ahead. Wilani, I'm sorry to hear about your dad. I'll be praying for you also. Congratulations to Josee on her GH final! It's a wonderful time experiencing an RWA conference. Good luck with your story. Debby, Thanks so much for sharing photos. It was fun to see friends and feel the excitement that conference brings every year. I hope to soak up more motivation from your thoughts and comments. You're much appreciated. RWA's workshops offer such a wide variety of educational opportunities. I hope it will always be that way. Jean, thanks for stopping by Seekerville today! Workshops at RWA are always the best! Big names with lots of great info are the norm! I always learn so much! I've signed up for Moonlight & Magnolias. Hope to see you there! Hi Jean! I also took that intensive workshop with Debby, "Stealing Hollywood." It was great! One of these days I WILL get down to Moonlight & Magnolias! 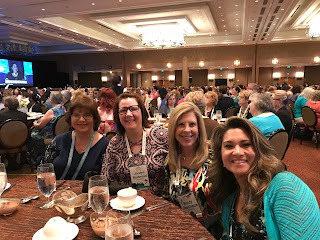 I had so much fun at RWA and hanging out with some of the Seekers & LI authors was exactly what I needed to re-energize and help me refocus. My only regret is that I didn't get to meet the lovely Josee in person, although I did see her in passing a few times. Oh, LeeAnne, I wish I had met you IRL...next time! Conference is funny that way...it's exhausting and overwhelming but at the same time, feeds our soul and helps us regroup. LeAnne, so great seeing you. Loved our chats! It's always wonderful to connect with writers we know through Seekerville or other social media. We all share that common writing bond! LeAnne, I loved meeting you! Really, we must do it again sometime soon. I think there is something magical about the whole conference experience. There is so much more of value going on off stage than is found in the lectures and workshops. When I listen to the tapes of the classes I attended later at home, I have to wonder "what was so special about this. I've read all this in craft books and it was a lot better presented in those books." I've had the same experience at music shows which I totally enjoy at the time, and yet, when I bought the group's CD, I was surprised later that "they really were not that good at all." It's the magic of the total event. And magic does not show up on the expense report! Lesson: Just go for it! I especially enjoyed your report because I believe you have captured the magic. I hope your post will inspires others to go to their first conference! Please put me in for the prize! My biggest 'hit' at my ACFW club was not any of my talks but rather bringing Ruth's Maple Fudge! You can get the recipe in Ruth's 'candy' romance and it works! P.S. Are either of you going to the ACFW conference in Nashville in September? Are you going to ACFW in Nashville, Vince? I will not be able to attend, unfortunately, due to another conflict. If you're planning to go, I'll be doubly upset that I can't be there to meet you in person! This year, I tried to pace myself, mainly because the altitude caused me problems. I had to watch so I didn't overexert. All of us were guzzling water, which is one way to help curb the effects of high altitude. Sometimes even that didn't help. Lots to learn at each conference, whether--as you mentioned--in the workshops or outside the classroom. I quit buying the conference recordings because I found I rarely listen to them all. However, if I hear of amazing ones that lots of people recommend, I'll buy that particular workshop recording. Hi Vince! I'm not going to ACFW this year, but I hope to attend soon. I also don't buy the conference tapes because I won't listen to them. And I totally agree with you, there is a certain magic to "being there." While I did get something out of most of the workshops, in full disclosure there were a few that didn't quite hit the mark for me, personally. Thank you, Josee and Debby for these highlights and photos! I loved all the photos last week on Facebook and was stalking - er, following - all my online friends who were in Denver and living vicariously through all of you. :) Even though I know all the reasons to go the extra $$$ exchange of the Canadian dollar just puts it out of my reach right now. Someday! It's in my five year plan. Till then, I'll buy the conference downloads and look at everyone's photos and enjoy those. So, thank you both for sharing your highlights! Hi Laurie! RWA and ACFW are both so expensive. 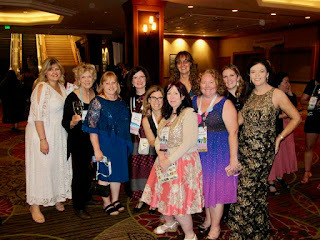 Would next year's RWA conference in New York City be a better fit? After that we go to San Francisco and then Nashville. Hi Laurie! Yes, it's pricey! I hope to one day meet my fellow Canadian in person! Awww, Deb and Josee, this was so fun to read! And seeing faces I know in some of those pictures made me smile. I wish I had thought ahead and made plans to meet you one day, since I only live about 70 miles south of there. :) It sounds like you both had an amazing time. Jeanne, I would have loved seeing you! How are the fires in your area? The smoke was thick when I was on the street in Denver. I couldn't smell it in the hotel, but the air outside was not good. Hi Jeanne, all this talk about ACFW makes me wish I were going! But yes, connecting with writer friends is good for the soul. Josee and Debby, thanks for the great recap. I haven't been to RWA in forever. I loved looking at all the conference photos on Facebook. Definitely made me wish I'd been there. It sounds like the workshops were amazing. But my number one favorite thing about conference is all the people you get to visit with. I would have loved to chat with you both. Hopefully someday! Terri, I still remember the lovely dinner we had before the RITA Awards Ceremony years ago. Were we in Dallas? I believe you wore a beautiful red dress. We had a large group, maybe 10 of us! That evening was so enjoyable ! Hi Terri! I agree with you, my favorite thing was meeting everyone and spending time together. Debby, I remember that meal! I love seeing RWA pics! I would've LOVED to have been there! I apologize if I totally missed it, but did anyone try the speed pitch? It sounded like so much fun. I was wondering if I'd like it better than traditional pitching. Hi Connie! The speed pitch filled up so quickly, few Golden Heart Finalists even got in. I heard from one person that it was good, although super crazy as you'd imagine. I'll try to get more feedback on that. I did hear that editors from the same publishing houses were sitting in the same areas so folks often pitched to two editors from the same house. Evidently, someone mentioned the problem and got the seating arrangement changed. I wasn't there so I'm just sharing what I heard. Connie, didn't I hear that you had good news? A contest final? Congrats! I placed in the Daphne which is BIG honor. Thanks! 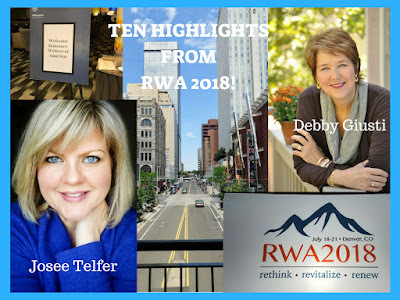 Debby, thanks for sharing some highlights of the RWA conference! It's fun to see some Villagers and Seekers and to remember all the great workshops and fun times of previous conferences. What number is this for you? I attended my first conference in 2005 and have only missed two conference since then. We always had fun together, Janet. I missed you in Denver!!! Janet, I think we all need to keep going to conferences forever. We'll call them family reunions! Debby told me how much fun she had with you, Janet! Missy, even though this was my first conference it did feel like a family reunion of sorts. OH!MY! 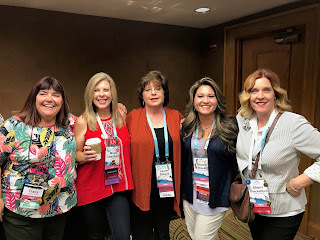 I love these photos from RWA! Looks like much fun! I'm glad you enjoyed the photos, Caryl. Conferences are always fun...and educational. It was fun, and a whirlwind and exhausting! But a great week overall. Thank you, Josee and Debby! 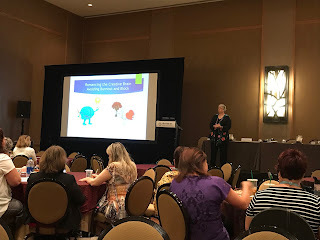 Seeing your photos and hearing about the highlights makes me want to attend an RWA conference even more. Meeting online friends in person would be the best for me! I appreciate you both sharing your experiences. Sherida, you're so right. Meeting online friends is so special. Because we've "chatted" electronically, we're friends even before we meet. Connecting faces with names is part of the fun too! Sherida, the first time I walked into a FHL meeting and met all the people I had known online for years, I burst into tears! It was so, so sweet to finally meet such special people in person. Thanks, Jill! So glad you could stop by Seekerville today! Sherri, so fun seeing you! Hugs! Hi Sherri! It was great meeting you in Denver! Hi Yvonne! RWA offers so much to writers no matter where they are in their publishing journey! Thanks for stopping by the blog! Hope all is well with you! Hi Yvonne! Oh my gosh...I finally got to meet TINA. She's wonderful! A definite highlight! This conference did seem to be fast paced with little to no down-time. I hated not having a chance to visit! I think navigating the maze that was Denver Sheraton took up a lot of our time. That and the altitude definitely made me foggy-brained. Winnie, I'm sorry I missed meeting you. I was at all times...................lost. Josee it was so nice to meet you! How'd it go at the airport? I've been afraid every since I told you about curb side check in that I gave you bad info.